Wi-Fi is great, but there are plenty of places where it's not available. This could be where a new Apple patent for short-range connectivity between two devices using low-power Bluetooth comes in. AppleInsider reported that Apple's latest published patent filing with the U.S. Patent and Trademark Office (USPTO) could be bound for future devices that lack a built-in radio transceiver, such as the fabled "iWatch" Cupertino is widely believed to be working on. 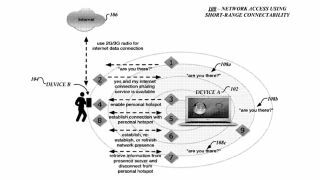 The latest application entitled "Network access using short-range connectability" allows devices such as the iPhone, iPad or iPod touch to not only connect to another gadget without a built-in radio, but also share a local network. Exactly such a scenario is what Bluetooth technology is intended for, but Apple's patent places emphasis on making such connections happen with as little user intervention as possible, all while conserving precious battery power. Originally filed with the USPTO in March, the short-range communications patent application makes no specific mention of a smart watch. "Users can leverage their mobile radio communication devices, such as their cell phones, to provide network access to their other devices without having to manually enable such connections," the patent description read. "In turn, the other devices can benefit from the network access while remaining in low-power mode during a short-range connection that uses a low-power enabled connection." The report theorized that such technology could be used for brief hotspot pairings between iOS devices and the rumored iWatch - just long enough to receive push notifications, iMessages, news or even emails. Who needs an iWatch when you can read our full review of OS X Mavericks?